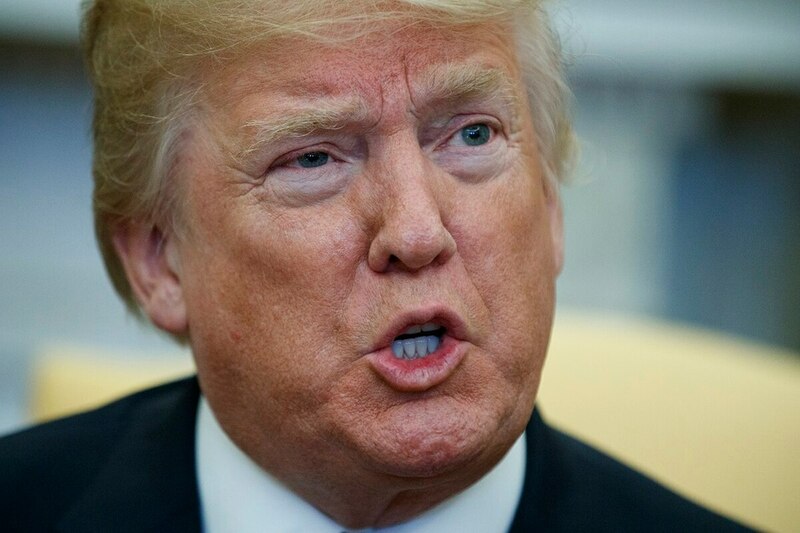 WASHINGTON — President Donald Trump insisted Monday that he’s “not backing down” on his plan to impose stiff tariffs on imported steel and aluminum despite anxious warnings from House Speaker Paul Ryan and other congressional Republicans of a possible trade war. “No, we’re not backing down,” Trump said in the Oval Office, seated with visiting Israeli Prime Minister Benjamin Netanyahu. “We’ve had a very bad deal with Mexico, we’ve had a very bad deal with Canada — it’s called NAFTA,” Trump said. Trump spoke shortly after a spokeswoman for House Speaker Ryan said the GOP leader was “extremely worried” about the tariffs setting off a trade war and had urged the White House “to not advance with this plan.” Republican leaders of the House Ways and Means Committee, meanwhile, circulated a letter opposing Trump’s tariff plan. The administration says the tariffs are necessary to preserve the American industries — and that imposing them is a national security imperative. But Trump’s comments and tweets earlier in the day suggested he was also using them as leverage in the current talks to revise NAFTA. The latest round of a nearly yearlong renegotiation effort is concluding this week in Mexico City. In the meantime, Trump’s tariff plan has been branded “absolutely unacceptable” by Canadian Prime Minister Justin Trudeau of Canada, and Jean-Claude Juncker, president of the European Commission has said the European Union could respond by taxing American goods including Bourbon, blue jeans and Harley Davidson motorcycles. Trump’s pronouncement last week that he would impose the tariffs roiled markets and rankled allies. “If you put a 10 percent tariff on aluminum, it’s a cent and a half on a six pack of beer and it’s $25,000 on a $330 million (Boeing 777),” Navarro said. Labor unions and liberal Democrats are in the unusual position of applauding Trump’s approach on grounds it will bolster jobs in a depleted industry, while Republicans and an array of business groups are warning of dire economic and political consequences. In the 2016 election, Trump’s criticism of trade agreements and China’s trade policies found support with working-class Americans whose wages had stagnated over the years. Victories in big steel-producing states such as Ohio, Pennsylvania and Indiana demonstrated that his tough trade talk had a receptive audience. Both House candidates in next week’s special election in Pennsylvania have embraced the president’s plans for tariffs. They addressed the topic Saturday in a debate that aired on WTAE in Pittsburgh.